This week's Tuesdays with Dorie (TWD) recipe was chosen by the group's founder, Laurie of Slush, and Jules of Someone's In The Kitchen: Midnight Crackles. 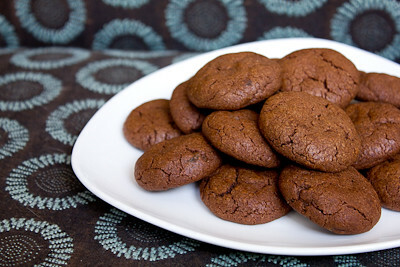 These are chocolate cookies spiced with cinnamon and cloves, named for their dark color and the crackles that form along the top when they are done. I decided to go with one of Dorie's variations and made the Choco-ginger Crackles. I replaced the cinnamon and cloves with ground ginger and added candied/crystallized ginger pieces. These cookies were very easy to make, and I definitely liked biting into the bits of ginger. My husband thought the ginger flavor in these was too strong, but he's not a big ginger person to begin with. I didn't find the ginger flavor overwhelming at all. However, I'm just not a chocolate cookie person in general. So while I enjoyed these cookies I probably won't be making them again. If you would like the recipe, you can find it here. Make sure you check out the TWD Blogroll, to see how everyone else enjoyed these chocolatey treats! - I used semisweet chocolate instead of bittersweet chocolate. - I used 1/4 teaspoon of ground ginger in place of the cinnamon and cloves. - I used 2 tablespoons of diced candied/crystallized ginger in place of the chopped stem ginger that Dorie recommends. - I refrigerated my dough for one hour, and still had to let is sit on the counter for a little bit before I was able to roll it into balls. - My cookies were done in 9-10 minutes. 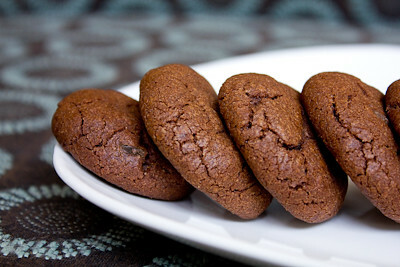 - Wrapped airtight, these cookies will keep in the freezer for up to 2 months. Too bad you didn't love them, but they look great! Yum! I adore ginger and chocolate, yet I rarely make it! I need to use it more! Also, have I told you how much I adore the little recipe notes you write on each post? is perfect and so helpful! thanks! I was curious about the chocolate-ginger version but not brave enough to try it since I wanted my husband to eat the cookies and he doesn't love ginger. Glad you enjoyed them even if you don't generally dig chocolate cookies. Love that top photo!